Soldiers smell the ground to detect bodies of flash flood victims in Taiwan after Typhoon Morakot battered the island's southern region in the second week of August. The typhoon, which Met officials call the deadliest in 50 years, also triggered mudslides; one such mudslide buried the entire town of Xiaolin. 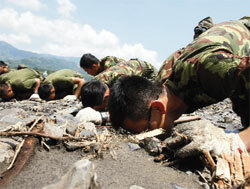 The government of Taiwan said it would take more than three years to reconstruct the devastated region. emissions by 40 per cent of the 1990 levels by 2020. As Ghana prepares to extract three billion barrels of petroleum from its oilfield by 2010, student groups said foreign oil exploration companies are keeping out communities around the oilfield. They could go the oilrich Niger delta way where popular discontent led to militancy, they warned. Zambia's government enacted a legislation regulating the functions of nonprofits. The government had to withdraw a similar legislation in 2007 following protests from civil society. The heaviest rains to hit Burkina Faso in 90 years have killed five people and left 150,000 homeless. Two hundred children living near an industrial park in China's Yunnan province fell sick with lead poisoning. This is the country's third such case in a month. About 1,900 children from Shaanxi and Hunan provinces tested positive for lead poisoning in early August. China is the world's top producer of lead. An acute water crisis in oil-rich southern Iraq threatens two million people. The government blamed its upstream neighbours Iran, Turkey and Syria for siphoning water from the Tigris and Euphrates rivers before they enter Iraq. Almond production in Afghanistan increased 20 per cent from last year but its price has fallen by 40 per cent, dealing a blow to farmers. Almond is a major revenue earner in the country ravaged by armed conflict. To attract foreign investment, Mongolia exempted foreign miners from a windfall profit tax. The tax, enacted in 2006, was delaying multi-billion dollar deals by Canada's Ivanhoe Mines and Australia's Rio Tinto to develop copper and gold mines in the Gobi desert. London Mayor Boris Johnson announced plans to create UK's first hydrogen highway by building a network of filling stations across the capital and launching hydrogen-fuelled buses and cars by 2012. As part of his agrarian reform, Bolivia's first indigenous president Evo Morales handed over 200,000 ha of land to the Guraya people. The land was occupied by European descendants since the country's independence in 1825. Bolivia is Latin America's poorest country. About 300 sea lions were found dead along Chile's northern Pacific coast. Authorities link it to lack of food in the Pacific caused by El Nio conditions that lead to unusual ocean warming. Ecologists blame it on mining operations nearby. Russian astronauts plan to carry Peruvian potato to the International Space Station as part of an experiment to evaluate how the vegetable grows in zero gravity. Workers in central Peru are demanding the government save their jobs by delaying the environmental cleanup of an 87-year-old smelter in the Andes. It has been the main source of pollution in the La Oroya city, ranked one of the 10 most contaminated on earth. Many in the city suffer from lead and arsenic poisoning. The Bahamas banned the possession and trade of marine turtles and their eggs. Turtle meat and shell is a major tourist attraction in the Atlantic archipelago. As per the World Conservation Union, marine turtles are threatened or endangered. As sea ice melts in the North Pole and opens up vast expanses of Arctic waters, the US government unveiled a fishery management plan banning fishing until researchers gather information about fish stocks in the waters. Australia's parliament passed a law mandating that 20 per cent of the country's electricity be sourced from renewables. The target matches one set by EU.